The dazzling fashion show that accompanies the Academy Awards show each year is almost as much fun as hearing the winners. This year, the 86th year of awards, some of the most memorable beauties flaunted Oscar night baby bumps elegantly caressed in very high fashion. TV personality and fashionista deluxe, Kristin Cavallari was a pre-Oscar fashion commentator in a vision of white. Her floor-length gown with sparkling cap sleeves was designed by Alexander McQueen; her earrings matched the cap sleeves flawlessly. Cavallari and hubby, Chicago Bears quarterback Jay Cutler, have a son, Camden Jack, born in 2012. Baby Boy #2 is expected soon. Twins are on the way for Elsa Pataky and hubby Chris Hemsworth. The Spanish-born actress wore a sleeveless teal-colored gown with plunging neckline and sequin-adorned cutaway embellishments. She and her Australian film star husband were married in 2010 and have a daughter, India Rose, born in London in 2012. Hemsworth and Charlize Theron presented the awards for Best Sound Mixing and Best Sound Editing. 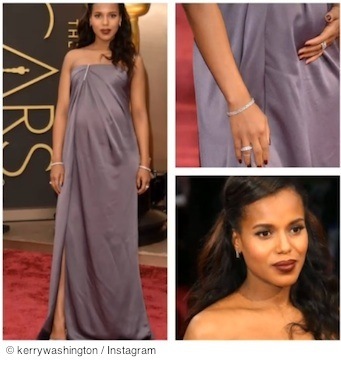 Soon-to-be-mom Kerry Washington chose a scandalously chic mauve strapless draped gown by Jason Wu. Jewelry by Jennifer Meyer completed the look. Washington married her favorite football player, Nnamdi Asomugha, in 2013. Washington introduced the performance of “Happy,” nominated for Best Song. It was a sleek black-and-white Valentino in a classic design for Olivia Wilde, who said she chose this particular dress because “it was my favorite.” Wilde is engaged to comedian Jason Sudeikis, who she started dating in 2011. Their first child, a boy, is due on May 4. Sudeikis and Kate Hudson presented awards for Best Live Action Short and Best Documentary Short Subject. Host Ellen DeGeneres went into the audience and encouraged some of the biggest names in Hollywood to gather around for a selfie to send to Twitter. The photo was retweeted enough times to break records — more than 1 million times its first hour online. DeGeneres also stunned a local pizza delivery man when she placed a big order for pizza and had the delivery man help her distribute it to the celebrities in attendance. The surprised pizza man was told he’d be delivering pizza backstage. Best Actress: Cate Blanchett won the Oscar for her performance in Blue Jasmine. Best Supporting Actress: Lupita Nyong’o won for her role in 12 Years a Slave. Best Actor: Matthew McConaughey for his performance in Dallas Buyers Club. Best Supporting Actor: Jared Leto for his performance in Dallas Buyers Club.